No, not a new Olympic sport. But it should be. An update: I failed Crutches 101 spectacularly the week following my surgery. By spectacularly I mean my right -- surgical -- foot absolutely refused to obey any and all new neuro-instructions I sent it. Instructions like, No, you may NOT step on that step and No, you may NOT bear weight on your poor, pathetic stitched-up tippy-toes. As a result, we had many scenes of me, on crutches, rooted to the floor as my right foot peddled furiously in mid-air, trying to find some worthwhile job to do. It was not pretty. Noting this failure as I flailed into my first follow-up appointment last week , Dr. T, the foot guy, did what any self-respecting foot guy would do: Introduced me to the wild and wacky world of crutch-walking. My right foot was much appreciative. It is now once again gainfully employed. Once you get the hang of it, crutch-walking is pretty simple. Your two crutches and surgical foot kick out first, theoretically all at the same time. (The boys and I had to work on this for a couple of days.) Non-surgical foot brings up the rear as crutches and surgical foot, together, do some light weight-bearing. My over-achiever right foot is happy -- and it's definitely easier (and kinder on woodwork around the house) than wheeling around with my knee up on a walker. There are, of course, some limitations. For one, you can't really carry anything since your hands are full of crutch handles. And occasionally, one crutch will snag up in the carpet, making for an interesting few seconds of see-sawing back and forth suspended between two stubborn sticks that each believe they have the territorial imperative. Nevertheless, while I'm certainly not going to sneak up on anybody (fyi, old-school wooden crutches creak like the dickens), win a foot race or dominate the hammer throw, crutch-walking is definitely an improvement on Crutches 101. Stowing your crutches, however, is another story. 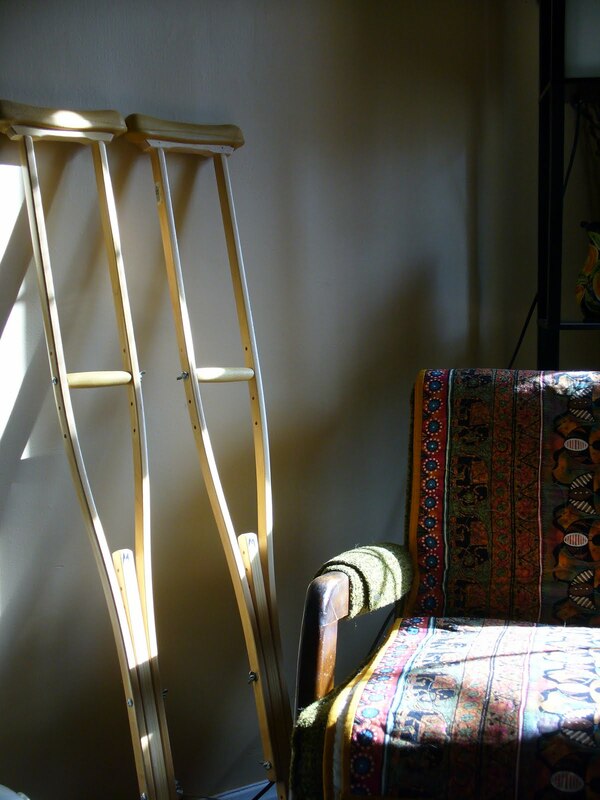 When you're on an ambulating roll, crutches work together like a well-primed machine. 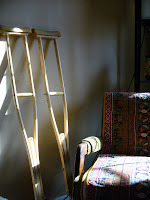 But, if I need to find a temporary home for them, my crutches are transformed into two energetic toddlers, slipping and sliding in different directions with little, if any, concern for my safety or convenience. All in all, I'm much happier crutch-walking. And I'll be looking for it at 2012 Summer Olympics.